Lent starts tomorrow! In the Catholic Church, Lent is a time of penance and preparation for the celebration of the resurrection of Jesus Christ from the dead. Most Catholic Christians “give up” something during Lent, such as desserts or TV or even Facebook, as a means of self-discipline and penance for sin, offering the sacrifice as a prayer of repentance. This year for Lent I want to stick as closely as possible to Dr. Peter D’Adamo’s Blood Type Diet for Blood Type O, while at the same time trying to make sure my Type AB husband is served the types of foods that are most beneficial for his blood type. Some people say there isn’t enough research done to justify Dr. D’Adamo’s theory “that appropriate diet and lifestyle depend in part on an individual’s blood type.” All I can tell you is that, when I eat according to the Blood Type Diet for blood type, I feel healthier, happier, and more energetic. Want to know more? 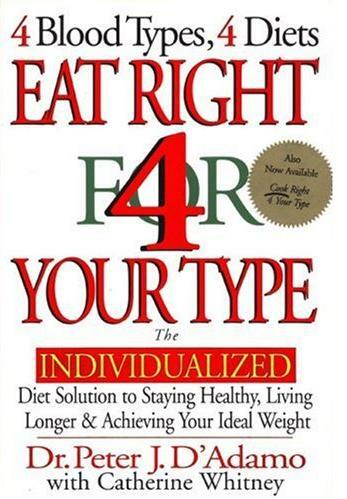 Visit “Eat Right for Your Type: The Official Website of Dr. Peter D’Adamo & The Blood Type Diet” at: http://www.dadamo.com/dadamo.htm. Cutting Back on Calories…But Not on Quality! o blood and far advanced osteoporosis, any guidance or advice please?